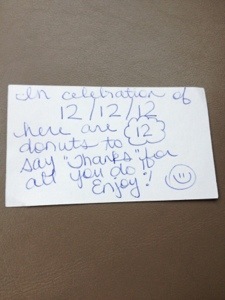 My 40th Random Act of Kindness! Wow! I can’t believe how quickly this 40th Birthday project has transpired from start to finish. Throughout this journey, I’ve met amazing people every step of the way. No, not amazing in the star-struck way… but amazing in the human spirit way. I have witnessed the power in a simple smile of appreciation as well as the unabashed tears of gratitude. 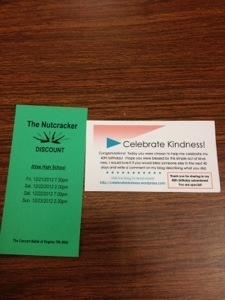 Performing 40 random act of kindness has blessed me so much more than I anticipated. This project has given me joy on dreary days, inspiration in the midst of drudgery, and hope for more things to come. As more and more people have learned about my project, a common question resounds: “What are you going to do for your 40th RAK?” There is an unwritten expectation that the very last of anything needs to be spectacular. Think about it! The final act of a play. The final chapter in a book. The final day of the year (which is today!) There is a bit of pressure to make this, my final RAK, one of great magnitude and impact. After many weeks of reflection, I knew exactly what do for my 40th Random Act of Kindness. And ironically, it sent me to the very place I began Random Act of Kindness #1. The grocery store. No… I did not perform another RAK at Kroger (although maybe I did and just didn’t write about it, lol.) No, this was strictly a mission to buy groceries. I needed three ingredients to perform my 40th RAK: cream cheese, chocolate baking squares, and a package of Oreos. If you’ve learned anything about me from my blog, you’ve discovered my love for blessing others by cooking or baking, and my 40th RAK would be no exception. Ladies and gentlemen, let me introduce you to the wonderful world of… chocolate truffles. Yes, I know I can spend $5.99 and get a package of elegantly wrapped delicacies in a shiny red bag. But I wanted to make a gift from the heart. A gift that took time. A gift to say “Thank You” for a very special group of people who have made an impact on my life. In the past few months I have unexpectedly undergone testing for breast cancer. What started off as a “let’s just do a scan to get a baseline” turned into urgent phone calls and additional testing when an unknown mass was discovered. Without getting into TOO many details (which I could, but might be TMI for some), let’s just say that I have had more tests, procedures and needles in the past three months than I’ve had my entire life. NOT A FUN PROCESS WHATSOEVER! There is something very humbling about lying in a hospital gown on a long hard table with an IV in your arm. Waiting. Wondering. Things in your life are quickly put into perspective when you go through a trial such as this (as I’m sure some of you know from first-hand experience.) Time becomes a vortex; you feel like everything around you is spinning. And then, like a real tornado, everything just… stops. Suddenly. Without warning. Done. My results declared I was cancer-free. I was one of the lucky ones. Ironically, it was a diagnosis with mixed feelings, as I’ve had many friends and family members undergo this process with unfavorable results. Yes, I was relieved, but then I felt guilty that I should be spared when so many others are not. Why am I the lucky one? I am no better than anyone else! It was a bit odd to have joy, disbelief, and discouragement all rolled into one phone call. The members of medical staff that assisted me during this time were amazing. In each step of this process they were compassionate. Gentle. Humorous. Attentive. The receptionist who greeted with a smile… the nurse who continued to call (despite being sent to voicemail over 5 times when I was in a meeting)… the technician who reminded, “This will only hurt for a moment”… the assistant who found a space heater to warm my cold feet in the recovery room… each and every person I encountered here showed me kindness. And to think that I am only one of the many patients they see from week to week. 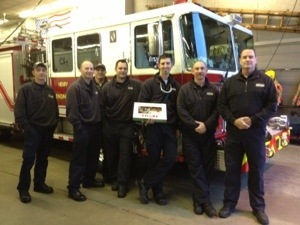 It was only fitting that I should use my 40th Random Act of Kindness to say “Thank You” for all they do. After gathering my supplies from Kroger, I came home and spent the afternoon making my goodies. (For those who want to see my truffle making step-by-step, you can visit my Snapguide site for the recipe with screenshots and captions.) I placed the truffles in a container and wrote a note inside of a Thank You card. 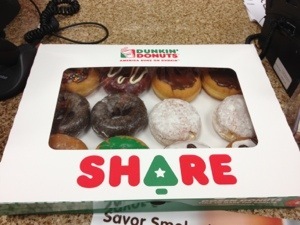 I then drove to the facility and dropped off my little container of treats. It was a very small gesture of appreciation, but one that spoke volumes from my heart. As I reflect on my 40th Birthday Project, I am in awe. What started off as a fun, creative way to celebrate my 40th birthday has turned into something quite grand. Over 6,000 readers from 20 different countries have viewed my blog site over the course of six months. WOW! Of those readers, several have written me personally to share their own acts of kindness or how they have been blessed by others. I am inspired daily by those who promote the good in others, as they truly rejuvenate the soul! A childhood song comes to mind when I think about my birthday blog. “This little light of mine… I’m gonna let it shine…” It’s true that I could have performed all these acts of kindness in secret, without fanfare or discussion. However, I believe we inspire one another, similar to iron sharpening iron. Being kind is contagious. Once you begin, you can’t quite stop. So keep going! That’s my plan. I may have completed my birthday project tasks, but this blog will keep going. Because kindness never ends! Happy New Year, dear friends, and may you find joy and happiness in each and every day of 2013! 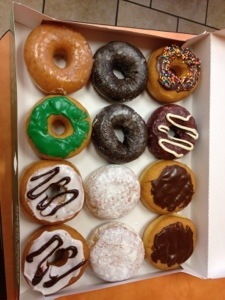 So I headed to our local Dunkin’ Donuts shop (no Krispy Kreme nearby), and ordered a dozen assorted donuts. 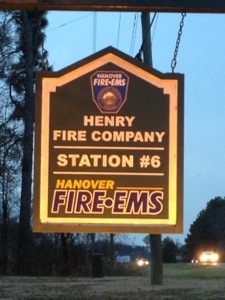 I knew exactly who would be so deserving of an unexpected treat… our local firefighters! So I scribbled a note on the back of my business card then drove straight to the fire station. 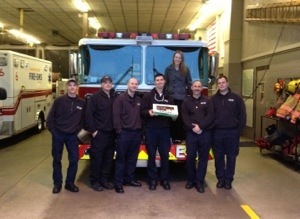 I met the fire fighters, thanked them for their service, told them about my birthday project then passed along the donuts. So fun! Even though it was a very small gesture to say “Thank You!” for all the amazing services our fire fighters provide for our community on a daily basis, I was glad I took the time out of my day to show my appreciation. 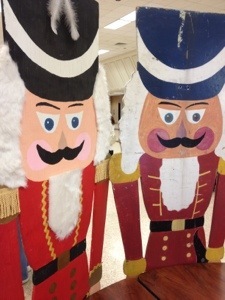 It was also a fun way to celebrate 12-12-12! Random Act of Kindness #36 – Triple Play! Yesterday I had the pleasure of completing 3 Random Acts of Kindness right in a row – the ultimate Triple Play! My first RAK was planned in advance, but the other two were 100% spontaneous “let me bless you because I can” moments. So much fun! 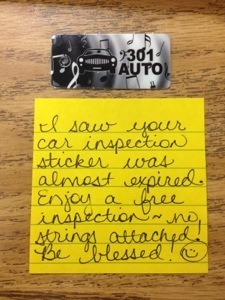 My planned RAK involved a coupon for a free car inspection my husband donated to my project a few months ago. (He bought a fundraising pack for my daughter’s chorus group and this was one of the perks included.) I decided to save the coupon for the month of December, when I knew money might be tight for some. The coupon itself was a little key ring tag (not a paper coupon) – I was lucky I never lost it because it was very tiny! 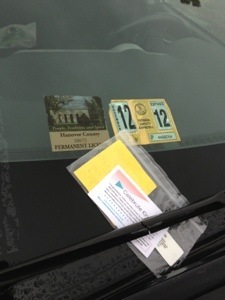 Knowing it could easily be overlooked, I decided to place it in a ziplock bag with a little note and my business card. Thursday afternoon, I went driving up and down the parking lot at Kroger, desperately seeking a car that had an almost expired inspection sticker. I couldn’t find a single one! Wow! It’s the very first week of the month and every car I saw had a renewed or current sticker. Bummer! On Friday, as I was leaving work, I scanned the parking lot on a whim. Bazinga! The very last car in my row needed to be inspected in December! Perfect! I placed my ziplock bag under their windshield wiper and said a silent prayer that the person I was blessing would see the gift before they turned their wipers on. I then made my way to the local mall to pick up a few birthday gifts. The weather was a bit dreary: cold, wet, blah. I passed the holiday bell-ringer as I entered the mall and sheepishly apologized for not having any cash to place in his Salvation Army tin. (If you know me well, you know I rarely carry cash.) As I passed through the main doors, I saw a woman pushing a shopping cart filled with store-bought bags as an older woman stood beside her with fingers wrapped around the handle of an infant stroller. I immediately backed up and reopened the glass door so the ladies could pass through easily, but they pulled their cart to the side of the wall as the younger gal started to gather all her belongings and bags. Have you ever stood there, holding the door for someone, only to realize you’re just standing there looking awkward because no one is walking through your door? Yeah, that was me. While I’m sure it was less than 20 seconds, it felt like an eternity. Suddenly it dawned on me: Why don’t I help the lady carry her bags to her car? It was obvious that she was struggling to carry everything in one trip (and to be honest, it kind’ve reminded me of when I bring groceries in the house, not wanting to return to the car for more bags.) As I walked towards her and offered to help, she politely refused at the exact same moment two of the bags fell from her hands. As I approached the mall again for the second time, I smiled at the bell ringer (who had seen the events unfold, I’m sure) then continued with my tasks at hand. I bought the birthday gifts, did a little bit of window shopping, then decided it was time to head home. As I rounded the corner back to the mall entrance (which was conveniently located at the end of the food court), I couldn’t resist the wonderful aroma of freshly baked bread. “Garlic Knots – 5 for $1.99” I peered through the slanted glass display and was suddenly thrown back to my college days when we would call in late night deliveries to our dorm rooms for freshly baked “Crusties” from Chancey’s restaurant. Such great memories! I smiled as the cashier asked, “What can I get for you today?” and pointed to the bread. Thinking they would just grab a few pieces of bread from the display, I was shocked when she said, “It might be a minute, we are baking a fresh batch right now.” A fresh batch? Straight from the oven? YES! I would be MORE than happy to wait a minute or two! I eagerly watched them pull the bread from their huge conventional oven, the same way you might pull out a pizza, and pack up my small package of Garlic Knots. (Did you know the wooden tool they use to pull pizzas out of the oven is called a “peel”? Yeah, me neither. I googled it, lol.) When the cashier handed me the styrofoam box, I could still feel the heat radiating from inside and the aroma was magnificent! What a treat indeed! And then I froze in my tracks. Literally. 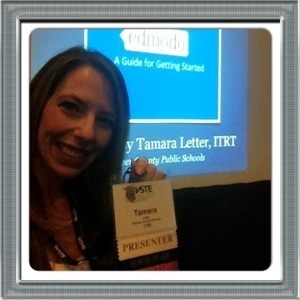 One of the favorite parts of my job as an instructional technologist is presenting at conferences. I love sharing my enthusiasm with others! Today I presented a session on Edmodo (a social networking platform for administrators, teachers, and students) at the annual Virginia Society for Technology in Education conference. The session was packed, standing room only, and the hour flew by. After presenting, I was allowed to return to participant mode. Since this conference is one of the only conferences my teammates and I attend to receive our own professional development, I was excited to learn new things from other educators and technologists. I made it into the next room and got settled just in time for the presentation to begin. Not even five minutes into the session, I could tell there would be issues. Apparently this particular room was the infamous black hole for wireless Internet and it seemed everyone was having difficulty accessing the resources due to this limitation. Most people handle this setback in stride (even if slightly irritated on the inside), but in this particular session there was one gal whose frustration had reached a boiling point. You could see her from a distance, huffing and puffing, making not-so-quiet comments under her breath… and with each passing minute her anger was rising to a crescendo. 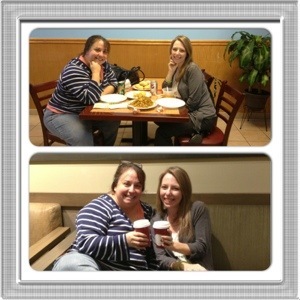 After the conference, I decided to surprise my best friend (whom I hadn’t seen in 5 months!). I took her out for a quick dinner at a local Chinese restaurant and a Starbucks for dessert, all the while listening to her frustrations of the day. By the end of our visit, she was all smiles, too, as she thanked me for being a friend to listen to her struggles. It was then that I opened my fortune cookie from the dinner. Wow! 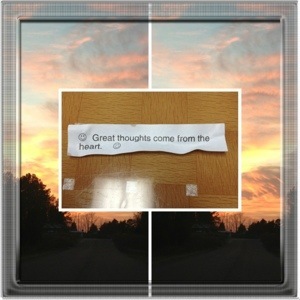 What a fitting fortune! It made me smile knowing that my little acts of kindness today may not have been sweeping grand gestures, but were still important because they came from the heart. I hope you will find a way to bless someone today, even if it is only to stop and lend a listening ear. We are all in this together, so the more we take time to look after one another, the happier a place it will be!